« “We so very rarely score two in a match…” You’ll never guess who was in the squad! 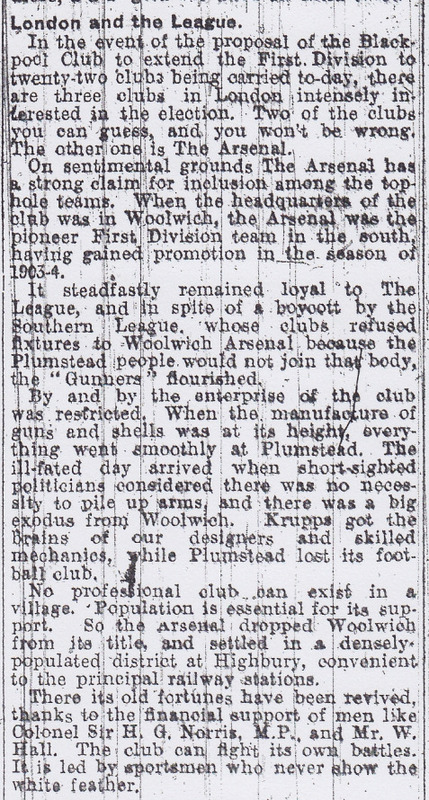 This article continues from The first suggestion that Arsenal could be elected to the 1st division which covers the first part of January 1919. On 13 January 1919 there was a meeting of the Football League with representatives of all the 40 League clubs except Glossop North End, which the Hill-Wood family had now pulled the plug on. The meeting’s agenda included the issues of getting to away fixtures by train (not all lines were working, and prices had risen by 50%), the demands of the Players’ Union on wages (both for 1918/19 and thereafter when the League itself resumed), and the state of the pitches, which had been neglected during the war and an extension to the season, to reduce the number of midweek games. There was also a debate on joining with the Southern League; this latter was turned down. As might be expected Sir Henry Norris not only attended, he took his full part in these debates, once more putting forward the view that there should be no maximum wage for players – although he was alone in this plea, and the League and the Union ultimately settled on £2 a week. The FA followed this with their own meeting the following day, formally allowing players to be paid (which they were being anyway), and allowing matches on days other than saturdays, and the holidays during Easter and Christmas. As had been the case each year, 1 May was designated as the day on which clubs could start registering players for the new season. A third meeting then took place in the evening of the same day (14 January) which voted to extend the football season in 1919/20. This was curious because with no extension to the number of clubs, and with a decision being taken at the previous meeting not to extend the season, there was no reason to go for an extension. But then, when has football management been reasonable? William Hall represented Arsenal at the meeting. It also became clear at this meeting that following the previous days’ meeting Claude Kirby, chairman of Chelsea FC, had written to the Football League Management Committee demanding Chelsea be reinstated in the First Division, in view of the fact that the match fixing activities of Liverpool had been part of the reason for their relegation at the end of the 1914/15 season. On 18 January Arsenal played Brentford as the London Combination wartime league continued through its final season. But what made this match so memorable was the crowd: 30,000 at Highbury, compared to 8000 for the same match at Highbury on 28 September. This was in fact the second time that Arsenal had an attendance of 30,000 this season – the first was on 12 October for the match with Tottenham. The last time before that on which the attendance had been equalled or exceeded was 18 April 1914, when, with no thought of war on the horizon, 35,000 had come to Highbury to see the game with local rivals Clapton Orient. There were two reasons for the size of the crowd. First, the troops were returning, and were anxious to catch up with their favourite pastime, and second Brentford were top of the league with Arsenal one place below them. An interesting turnaround from last season where the clubs came 5th and 6th in the 10 team league. 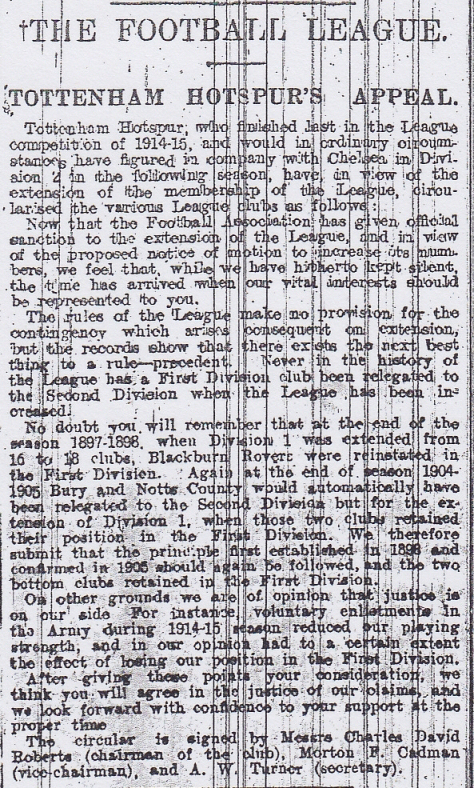 Having launched their notion that Chelsea and Arsenal should be in the First Division next season in their last edition, Athletic News now approached the subject from a slightly different point of view: that if neither were elected to the expanded league for the 1919/20 season, London would have no teams in the top tier of English for the first time since 1903/4. Of course that might have been a cause of some rejoicing among the teams of the north east and north west, who might welcome the absence of away games at such a distance – not least because of the aforementioned lack of railway reliability and the hike in prices. But there was a danger in pursuing this line, because the Southern League were still making noises about joining the Football League, and the London Combination was also talking up the possibility of their continuing with an enlarged London and the South East league. Given the current transport issues, this could well be an attractive idea. True, Arsenal, Tottenham, and Chelsea might be in the lower tier with Fulham, Clapton Orient and West Ham (who were not currently in the League but were thinking of joining if there was an expansion), but as we saw in the last episode, the two most supported clubs in the whole of the Football League were Tottenham and Chelsea. What’s more second division Arsenal, were the best supported 2nd division club in the country with a better home support than half of the 20 first division sides. The inevitable conclusion was that London was currently powering the desire for football, and if football wanted to continue to develop its position as the national winter sport, it needed to nurture its position in London. Having no clubs in the first division was not the most obvious way to do this. Furthermore, if the League were not careful, the attraction of the London league clubs uniting with the Southern League (once more taking into account the current problems and costs of train travel) would rise up the agenda. The “London problem” was suddenly taking on an importance of its own, which the multiplicity of meetings, each drawing different conclusions, was not helping to resolve. And then, at this moment of much pondering about the future, Charles Sutcliffe wrote an article about his views concerning the future of football, which was highly significant for when Sutcliffe spoke, football tended to listen. He had been a player, and a referee, and is credited with founding the Referees’ Association. Later he became a director of Burnley, and most significantly, was a member of the Football League Management Committee, introducing, among other things, automatic promotion and relegation. Prior to the introduction of automatic promotion there had been a series of play offs in a mini league between the two lowest clubs in the first division and two highest in the second. However the 1898 play offs had ended in controversy with the last two teams to play both knowing that they each only needed a draw to go into next season’s first division. As a result they played the game by knocking the ball backwards and forwards with no attempt to launch an attack. There was a public outcry. Two events followed. First the League was expanded by two for the following season, thus giving all four teams involved in the play-offs a place in the first division. Second automatic relegation and promotion was proposed by Sutcliffe for subsequent seasons, and this had duly come about. Thus he was a man who was listened to, and very much considered a senior figure in football, and he now wrote that just as in 1898 the Football League had had a moral duty to help the clubs denied promotion by the “fixed” final game, so now the League needed to rectify Chelsea’s position forthwith. He proposed that the two top teams from the second division in 1914/15 should be promoted as everyone naturally expected. But in addition there should be a voting system to find two more clubs to join them in the first division. This, he said, would allow other clubs to put right the wrong done to Chelsea, and allow the clubs to vote for one other team to join Chelsea and the promoted clubs. This seems to have been instantly accepted for I can find no articles that argued for anything other than a vote. The only question was who to vote for, aside from Chelsea. 21 January there was a full meeting of the London County Council which Sir Henry Norris attended, and at which the prime issue of debate was the overdue LCC elections. The councillors decided that these would go ahead, despite the fact that soldiers not yet demobbed would not be able to vote in them. On the same day the Dáil Éireann – the Parliament comprising Sinn Féin members elected in the 1918 general election who were not taking their seats in the UK Parliament in London – met for the first time. Elsewhere the first deaths occurred in what quickly became the Irish war of independence. Two days later there was a serious racist confrontation between black and white merchant seamen in Glasgow in what became known as the Harbour Riot. On 25 January Arsenal played their last game of the month, beating West Ham away in front of 18,000 fans – not as many as had attended Highbury the week before, but still a huge increase on the figures for the previous year. On 27 January general strikes over wages were called in Belfast and Glasgow, and on the same day the FA met in London and confirmed that there would be no FA Cup for 1918/19 (which was obvious, since the preliminary rounds then as now needed to start in September for the Cup to take place, and no room had been left in the league schedule even if only the league clubs took part. The FA also resolved to try to negotiate with the government with the removal of Entertainment Tax from the cost of attending football matches. The idea of extending the season was rejected – although with the league already committed to expansion this clearly was going to lead to a problem, because midweek afternoon games always attracted smaller crowds that Saturday games. In this week’s edition of Athletic News Blackpool FC was reported to have formally proposed the election of two extra clubs to the first division and stated that Chelsea, Tottenham and Arsenal would have an interest in it. They also set their stall out by supporting Arsenal’s claim to a place in the top flight. Shortly after this date Chelsea chairman Claude Kirby wrote to the Football League Management Committee requesting that Chelsea be re-instated to the First Division for the 1919-20 season due to the exceptional circumstances of the Manchester United v Liverpool game. On 31 January 1919, The Sportsman (a London based sports paper) reported that Tottenham had sent a letter to all the other League clubs putting forward their arguments as to why they should be elected to the First Division. Meanwhile the political situation was getting worse and on 31 January the Battle of George Square took place in Glasgow as the army moved in with tanks to confront protesters who were complaining about escalating rents in the city. Here is a list of the games for January 1919. I have oft mentioned, in this series, the debt that I owe to Sally Davis for her work on the life of Henry Norris, and the work of Andy Kelly in tracking the history of Arsenal FC. It was Andy’s article “Arsenal’s election to the First Division in 1919” published on this site which took matters further forward, and I would again like to reiterate my acknowledgement to the work of both researchers for their tireless work in this field. I must also acknowledge the work of Fred Olier in publishing the details of Arsenal’s wartime matches in his volume “Arsenal: a complete record”. I believe I have omitted to do this, thus far in the series, which is remiss of me. When the series is concluded I will set out a proper set of acknowledgement of all sources used.